A man with a woman and child is building a structure between two cabins. In 1936 during the Franklin D. Roosevelt presidency, the Farm Security Administration (FSA) was set up to meet the health and housing needs for migrant families. In June of 1938 work was begun on the Linnell Camp, and on Decmber 16, 1938, the camp was officially opened. The East Union School is shown on the site, and it was built in 1939 for the Linnell Camp elementary students. Road 156 is shown running along the West side of the camp. 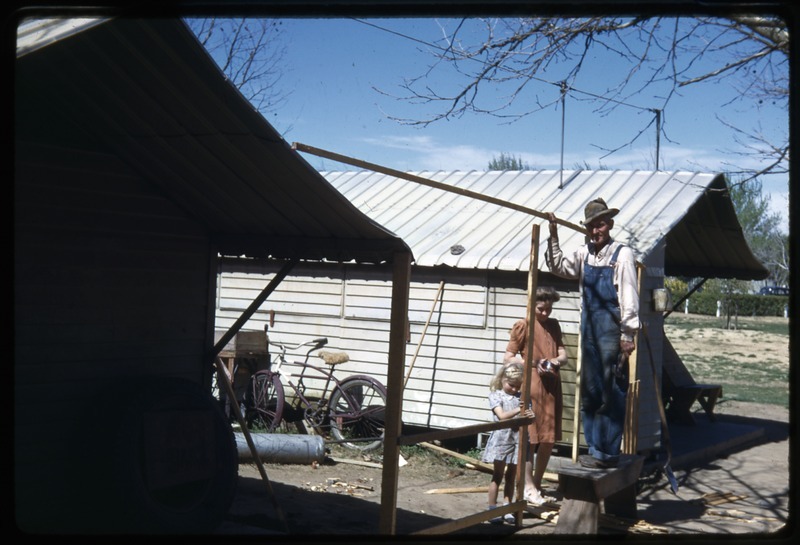 “A Man Building A Fence,” San Joaquin Valley Library System Digital Collections, accessed April 18, 2019, http://digital.sjvls.org/document/5684.